Will Panasonic Bring LiON Rechargeable Batteries To The Sanyo Eneloop Brand? Sanyo Eneloop continues to be the clear quality and performance leader in NiMH rechargeable batteries. But with Panasonic continuing to push its industrial line of LiON rechargeable batteries, will the company eventually add LiON into the mix? When you think LiON rechargeable batteries, what comes to mind are proprietary battery packs for electronic devices, such as laptop computers and mobile phones. However, LiON rechargeables are not relegated to being mere battery packs — the technology can also be developed into cylindrical battery forms that could fit just about any device. Sanyo, and its parent company Panasonic, were recently fined over $56 million dollars by the U.S. Justice Department, along with a smaller company called LG Chem Limited, which will pay $1.06 million. Both companies were involved in a battery price fixing scheme that was considered so serious that the U.S. DoJ’s fines and charges are criminal. The battery cells in question were part of a larger issue of the companies price rigging a wide range of auto parts for Hondas, Nissans, Toyotas, and Mazdas between July of 1998 and 2010. Because the conspiracy was so deep-rooted and dominated the market for these components for so long, the charges brought forth were among the most serious ever seen levied in the battery sector. And it isn’t over: Panasonic/Sanyo executives could go to jail over the scandal. Are Premium Brand Rechargeable Batteries Really Better Than Generic Brands? From Sanyo Eneloop all the down to cheap, generic brands, there is a wide range of premium rechargeable batteries to choose from? But do you really gain better performance from the premium brands? A couple years ago, when Apple released its own brand of rechargeable batteries, there was a great deal of excitement in the tech media. Apple, after all, spends millions of dollars a year in rechargeable battery research, with most of its R&D resources going into improving the LiON battery packs that power its popular mobile products, such as the MacBook, iPhone, iPad, and iPod. It didn’t take long, to reveal that Apple’s AA NiMH rechargeable batteries for its wireless keyboards are actually made by Sanyo Eneloop and rebranded. Some were disappointed, but for avid rechargeable battery enthusiasts, it was an endorsement for Sanyo Eneloop: if Apple was willing to stick its own brand on Sanyo Eneloop-designed batteries, they must be high quality, right? Sanyo Eneloop‘s industry leading AA rechargeable batteries are only rivaled by their accompanying AA battery chargers. Take a look at two of the leading models of Sanyo Eneloop AA battery chargers on the market today. When investing in rechargeable batteries, buying the batteries themselves is only the beginning: while you may need to invest in dozens of batteries for whatever battery-dependent hobby of yours may be, it is important to not overlook the importance of a high-quality battery charger. 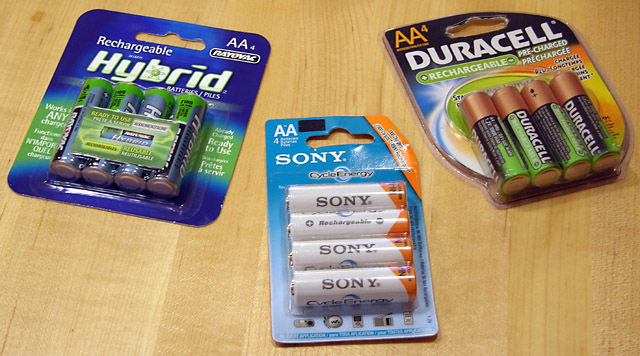 Fortunately for the consumer, most of the top rechargeable battery companies not only sell batteries in packs, but also in tandem with battery chargers as well.